As I entered Kibale Forest in Western Uganda with a group of students from McGill, I was warned against the hazards I might encounter. Kibale is a protected mid-elevation moist forest – the jungle of Tarzan stories – that is home to many species of monkeys and chimpanzees. The rustle of leaves in the tree canopy high above the trails as monkeys bounced from branch to drooping branch drew my eyes upward. But I was warned to keep my eyes on the ground so as not to inadvertently step on a snake, or into an area of swamp. I was sure to wear protective footwear and although it was warm I wore long sleeves and trousers to avoid malaria-carrying mosquitoes or to avoid contact with stinging nettles or biting insects. There was also the possibility of running into a troop of baboons or even a forest elephant that could plough through the dense underbrush more quickly than I could if he decided to chase me. I saw bees and wasps and huge, fat earthworms that were over a foot long. The trails were muddy and sometimes slippery. The forest was a lush green and exotic birds flitted from branch to branch, often making jungle sounds. The hike deep into the forest filled me with a sense of romantic African adventure. (Do I sound like J. Peterman from Seinfeld?) I had been adequately warned of the possible looming danger. 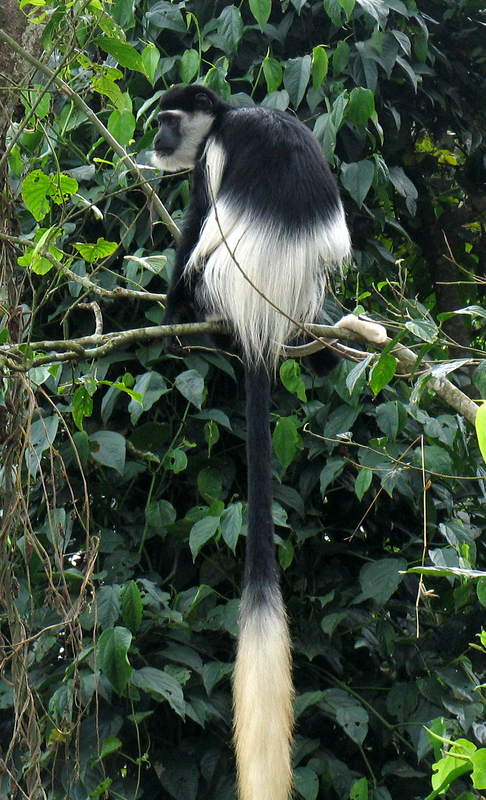 A Black and White colobus monkey in the trees of Kibale Forest, Uganda. 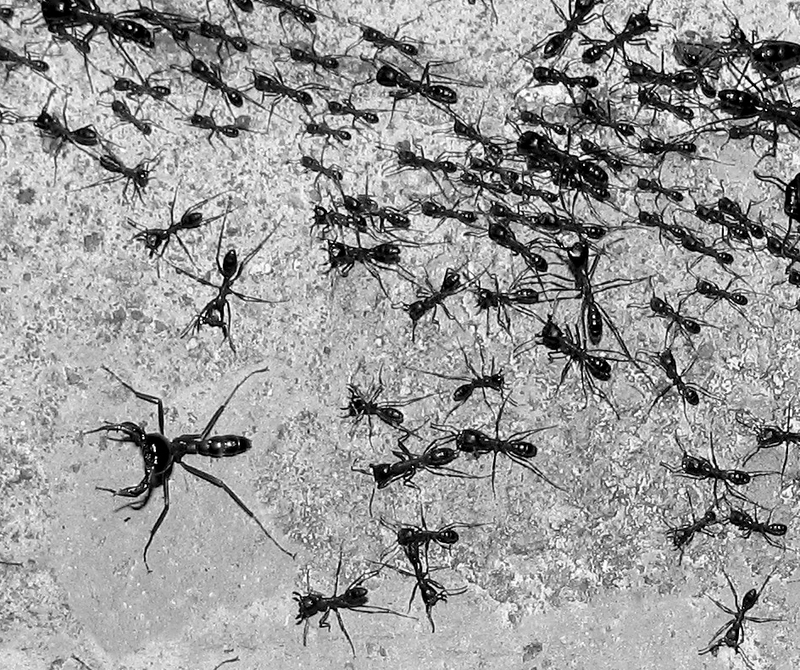 Our guide, however, had neglected to tell me about the Army Ants, little critters that mass into legions to scour the ground looking for food. If one accidentally disrupts them by standing in their path, they scatter; then they race up the nearest pant leg in search of tender flesh where they grab hold in a hot sting. The females are not very big but they move quickly and once buried deep in clothing creases, seem to all decide to bite at once. The larger males appear more threatening, tend to act as guardians and have menacing pincers that grip like a stapler. Rumour has it that these are even strong enough to be used to hold skin wounds together like sutures. Whenever we encountered these ants in the woods we were respectful, jumped quickly past them and spent the next five minutes swatting at any little tingle we felt in our pants. A couple of weeks later, I was staying alone in a small cabin near the edge of the forest. At night my closest neighbour was about half a kilometer away down a dark path. It was wonderful to sleep at night with the window open, the sounds of the birds and bugs and baboons in the forest occasionally punctuating the silence. You can imagine my surprise when I woke up at 3 am one night to find my bedroom being invaded by Army Ants. I was sleeping under my mosquito net when I became aware that I was not alone in the room. At first I thought perhaps there was a moth fluttering around or perhaps it was a gecko on the wall catching flies. The electricity was out so I used my flashlight to get up, wander into another room and eventually outside to admire the brilliant stars sparkling in the clear, black Ugandan sky and listen to the occasional croaking call of a Colobus monkey. A few moments after I crawled back into bed, I felt a tickle on my arm, then my back, then my leg. I brushed aside something crawling on me, grabbed my flashlight and quickly found that there were a dozen or more ants roaming the bed sheets and looking for me. Army ants. Where were the rest? I swung my flashlight beam onto the floor. Thousands – yes thousands – of ants were parading around the door jamb and the perimeter of the room. A two inch wide swath that flowed like a black stream stretched from the back door of the house and now encircled my bed. I was under attack. I grabbed my shoes and anything lying on the floor and threw them on a nearby table. For the next hour I perched on a wooden chair in the middle of the room my bare feet up off the floor on the chair rungs and my flashlight beam scanning the invading army like a prison beacon looking for escapees. Would they crawl up the furniture? Would I be found in the morning, covered in ants in a heap in the middle of the room? Eventually, despite my uncomfortable position, I dozed back to sleep. When I jerked awake an hour later they were gone. Totally gone. All of them. I actually started to wonder if I had been hallucinating – a common side-effect of some of the malaria prevention drugs. So, in the morning, I quietly told a friend who works in the forest regularly about my invaders. “Oh, yes,” she said, “The Army ants clean up our house occasionally. They get all the crumbs on the floor and even catch the odd small rodent!” I wasn’t crazy after all. Travel in Africa conjures up images of being attacked by a lion or trampled by an elephant. I’m embarrassed to relate that it was ants that terrorized me one muggy, sleepless January night in the Uganda forest. This entry was posted in Uncategorized and tagged Africa, ants, Army Ants, Forest, Kibale, night, terror, Uganda by johnageddes. Bookmark the permalink.